Each client receives detailed monthly report. If we get your business website Page One Rankings in Google, Yahoo etc. for your keyword phrases, it will always gain you more traffic. How much more traffic? 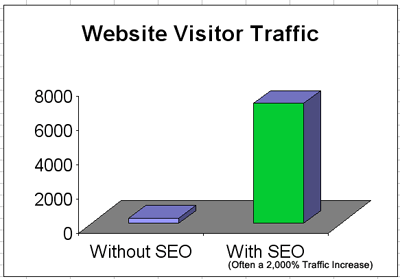 Up to 10 to 20 times more traffic than your website without SEO. The average website has 300 to 400 visitors per month. However, after only 6 months of our effective SEO program, our clients often have traffic of 5,000 visitors per month and even more. The best part about our “Top-20 Ranking Service” is that for a small, tax-deductible investment, we can often achieve Page One results for your website too! This way you can relax, knowing your search engine marketing is in the hands of experts running on auto-pilot. This alone is worth many times the cost. Another Madison Avenue firm charges an outrageous $40,000 to $350,000 per month. While they do serve Fortune 500 companies, I can’t imagine where the value comes in at these rates. We offer plans starting at $200 a month regional and is unparalleled in coverage and depth.